Become a Polar Bear Explorer this December! We’re pleased to be part of the Polar Bear Explorer Trail! 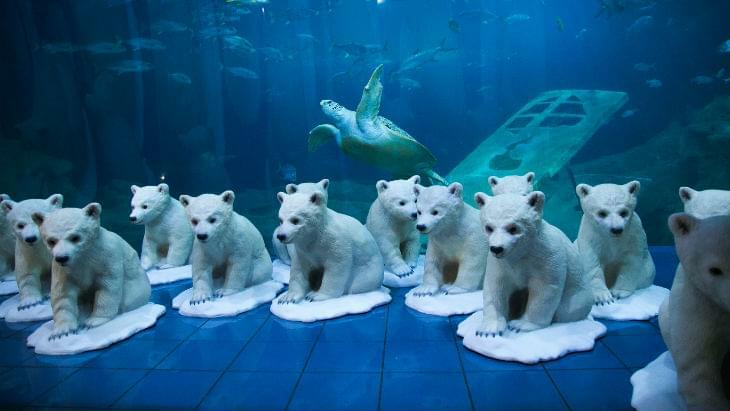 Starting on the 25th of November, you can look for 20 polar bear cub sculptures across Plymouth’s waterfront. Become a Polar Bear Explorer for a chance to win prizes and a certificate from us! Hosted by the NMA and What’s on Plymouth, these sculptures will be let loose across Sutton Harbour, The Barbican and Hoe, Millbay and Royal Willam Yard. Each cub will have a Bear Fact with them, telling us about the Arctic and the Oceans, how plastic is affecting their homes and how we can all help. As a Polar Explorer, your task is to find each of the Polar Bear Cubs with their facts. 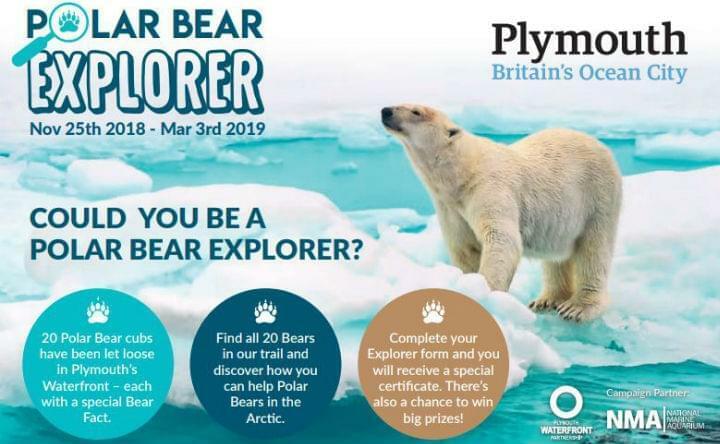 You can download the trail brochure from the VisitPlymouth Website, and using the Explorer on page 11, write down the key word from each of the cubs’ Bear Facts. Once you’ve found all 20 facts – complete the Explorer form with your details and make a pledge to help Polar Bears by reducing single-use plastics at home, at school, and in the workplace. Deliver your Explorer from to one of the Arctic Post Boxes at the National Marine Aquarium, or you can deliver it to the Barbican Tourist Information Centre or Bistror Pierre…you can also mail it to: Polar Bear Explorer, Plymouth Waterfront Partnership, Ballard House, West Hoe, Plymouth PL1 3BJ or enter online. Why a Polar Bear Trail? Polar bears are the largest land carnivores in the world! Male polar bears are 2.5-3 metres long which makes them much bigger than females. They can weight 300-650 kilograms which is about as heavy as twenty-five eight-year-old children! Polar bears have black skin under their glistening coat. Their fur is transparent with a hollow core that reflects light from the sun and snow, which makes them look white. Unfortunately, polar bears are classed as ‘vulnerable’ on the IUCN Red List. This means they could go extinct if we don’t look after their home. The biggest threat to them is climate change, but by getting involved and making a difference to your lifestyle, you can save theirs. So get your snow shoes ready to find all 20 cubs along the Plymouth Waterfront! The event runs from now to Sunday the 3rd of March. Good luck!